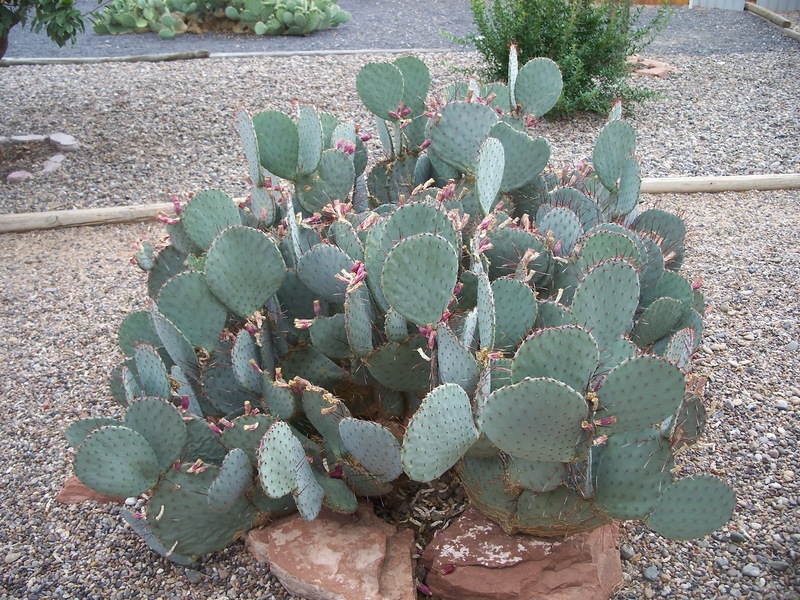 Black-Spined Prickly Pear (Opuntia macrocentra) is also commonly called Purple Prickly Pear or Nopal Violaceo. 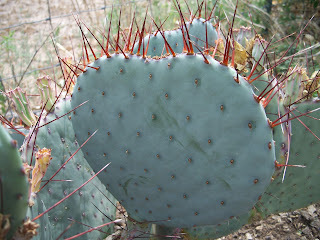 Black-Spined Prickly Pear typically has long black spines only on the upper surfaces of each pad. It is one of the more beautiful New Mexico native prickly pear species. It does very well in the Central Rio Grande Valley of New Mexico growing to about 3 feet high with a wider spread but can be kept smaller by pruning. Use Barbeque tongs and pruning shears to prune. 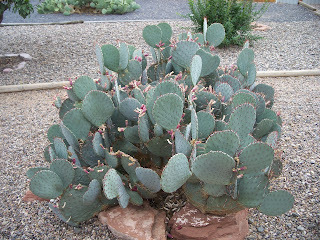 This prickly pear produces yellow flowers with reddish centers in late spring / early summer. After flowering it produces a fruit or tuna which turns red at maturity. 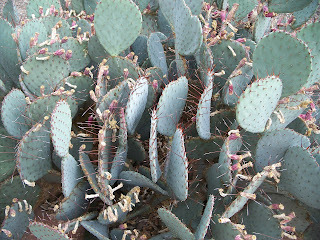 The fruits of this prickly pear are not usually eaten as they quickly dry , shrivel, and are filled with seeds. During winter, the cooler temperatures cause the pads to turn beautiful shades of pink, purple, and blue-green. Pads re-green in spring with the warmer temperatures. We have observed that during winter, pad droop (wilt) is usually less than other prickly pear species making it a good year-round addition for your xeric landscape. 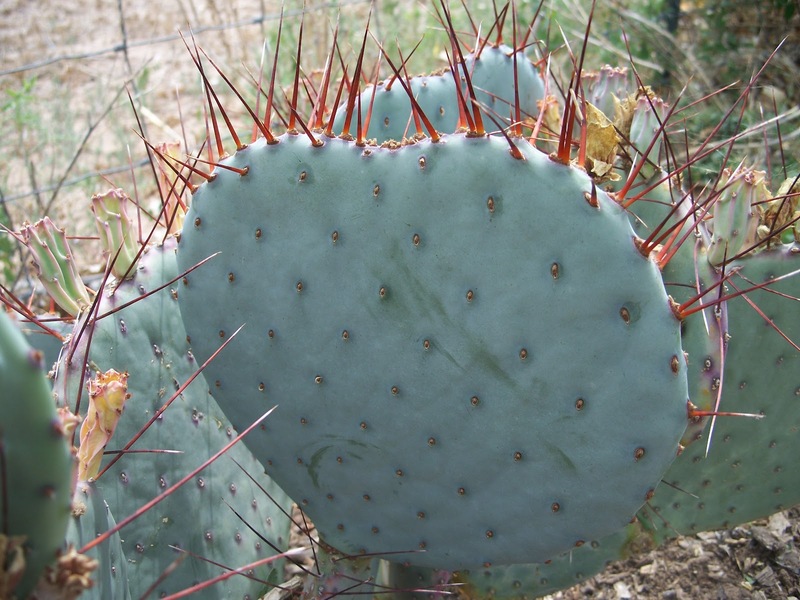 This prickly pear requires very little water and does best in well-drained soils. Black-Spined Prickly Pear is hardy to USDA Zone 6. Contact Trees That Please Nursery for more information, availability, and pricing. Most of the native Purple Prickly Pear I've ever seen is in the areas in and around Tucson, especially Saguaro National Monument. Beautiful Cactus. Over in Tenerife this past February 2012, I collected a variety of Prickly Pear which unbelievably is bright rich green with long bright yellow spines. Smuggled it back here to Sweden in a heavy duty brown paper bag. Can only imagine what it must have looked like under the X-Ray machine. Actually grew a newer pad for me this year when I was finally able to move the pot outside in late June. Unfortunately the native snails and non-native spanish slug did a number on the young pad.